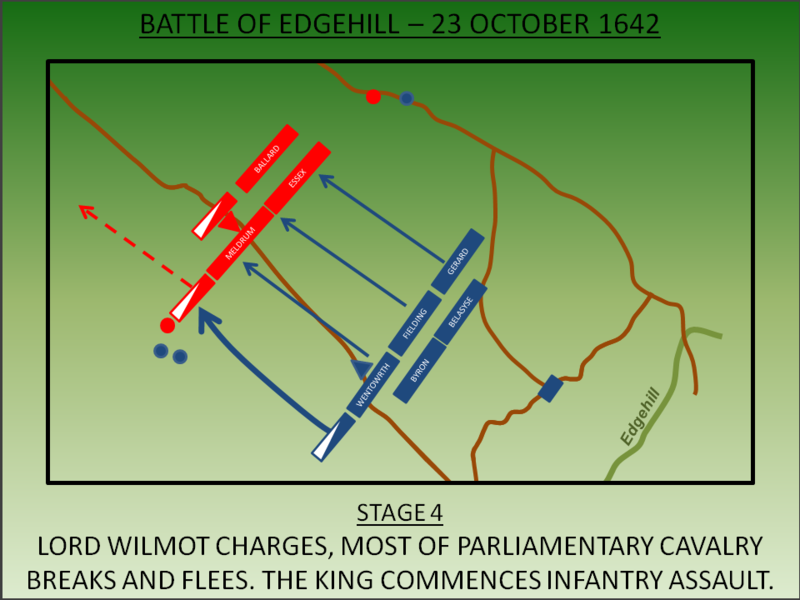 The large but amateur armies of Royalists and Parliamentarians clashed in the first proper battle of the First English Civil War at Edgehill on 23 October 1642. A confused affair, it was nominally a Royalist victory but awoke both sides to the prospect of a protracted conflict. In 1625 Charles I, the second King to rule both England and Scotland, came to the throne. He strongly believed in the divine right of Kings and concurrently sought to introduce Catholic style reforms into the Church of England. Both actions brought him into disagreement with the English Parliament and Scottish Kirk. In 1629 Charles dissolved Parliament and ruled for eleven years without reference to them - a period known as the “Eleven Years' Tyranny” or the “Personal Rule”. To sustain his Government, Charles re-introduced numerous money making schemes; Ship money, Court of Wards and fines for individuals wealthy enough to be knighted but who had not undergone this honour at his coronation. Combined with the religious changes, such measures made Charles and his government extremely unpopular but was effective enough in generating income to sustain the Kingdom in peacetime. However peace didn't last. Scotland erupted into violence when Archbishop Laud tried to impose the English Prayer Book on the Scottish church. Charles needed an army to deal with the subsequent Bishops Wars and this required money. Accordingly he recalled the English Parliament (the 'short Parliament') who worked in co-ordination with the Scottish rebels to extract significant concessions from the King. It all proved too much for Charles who dissolved Parliament once more. The situation came to a head in October 1641. Rebellion of the Catholic populace in Ireland forced Charles to recall Parliament (the 'Long Parliament') again. Whilst acknowledging the need for an army to be raised and funded to fight the Irish rebels, Parliament was reluctant to grant such power to the King. Instead Parliament passed a Militia Ordnance - effectively an Act of Parliament simply lacking the King's signature - and seized control of the Trained Bands that constituted the Army. Charles expressly overruled this but now both sides were building their armies. On 23 August 1642 Charles officially raised his standard at Nottingham and declared war on Parliament. By late September both sides had significant forces at their disposal; Parliament's army under Robert Devereux, Earl of Essex moved towards Worcester whilst Royalist forces were at Shrewsbury. A skirmish at Powick Bridge on 23 September 1642 confirmed that hostilities had started and the Royalist forces began preparations to advance on London to bring the war to a speedy end. The Earl of Essex now sought to block this advance and moved his army from Worcester towards Warwick. The King however had already unwittingly by-passed his enemy but on the evening on the 22 October the two armies became aware of the other's presence. The King had the option to continue on towards London or fight the Parliamentary force now to his rear. He opted for the latter and mustered his forces on Edgehill Ridge. 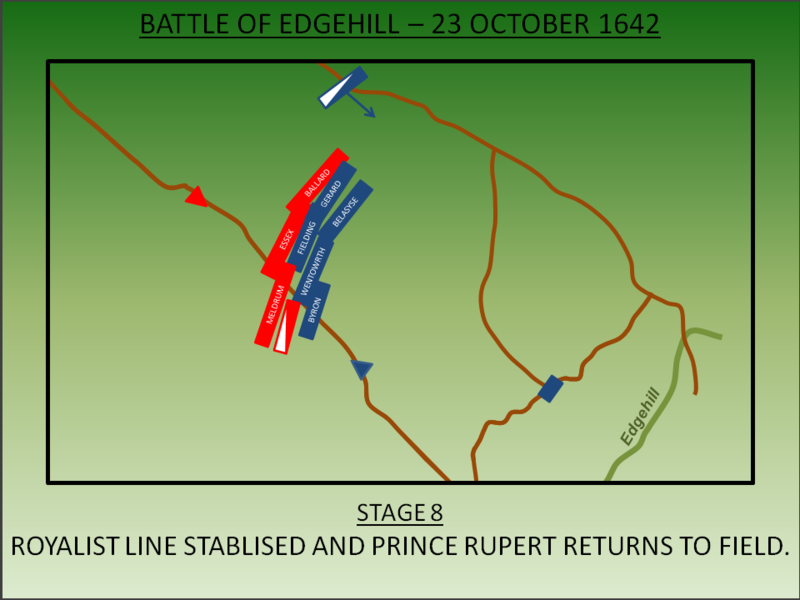 By dawn on the 23 October his cavalry, under Prince Rupert, was in place but it was early afternoon before his infantry and artillery were ready. The scene was set for the first battle. The Royalist army was configured in five brigades of infantry with three in front and the remainder to the rear, each configured with pike-men in the centre and musketeers on the flanks. In total the Royalist infantry was probably in the region of 11,000 men. The cavalry - the Royalists' greatest asset - was on the left and right wings of the infantry. On the right was Prince Rupert's force possibly 1,700 strong whilst on the left was the smaller, but at 1,300 men still significant, division under Lord Wilmot. Each cavalry force was augmented by Dragoons numbering around 600 on the left wing and 400 with Prince Rupert on the right. In support were the artillery forces; the Royalists had six batteries positioned on Edgehill and fourteen lighter guns embedded with the infantry brigades. The Parliamentary army was configured in two lines with two infantry brigades in front - those under Colonel Charles Essex and Sir John Meldrum - and a third brigade to the rear under Colonel Thomas Ballard; in total the infantry force was probably 12,000 men strong. The bulk of the cavalry forces, which numbered around 2,000, were positioned on the wings although on the right Sir William Balfour was offset behind his infantry. As with the Royalists, Dragoons were positioned on the outer wings of the cavalry. Artillery support was also available to Essex who had up to thirty light artillery pieces mainly deployed in a battery on the right of the army. Essex was reluctant to commence the battle for multiple reasons. Firstly there was clearly a political benefit in ensuring the King conducted the first aggressive act. Perhaps more importantly though, the Royalists held a strong position on top of Edgehill ridge. Any attack on such an obviously superior position would have been costly. Furthermore Essex was also aware he had reinforcements on the way which would have significantly uplifted his forces in both infantry and cavalry. Despite Essex's reluctance to attack, the Royalists were minded to engage and descended down Edgehill to deploy opposite the Parliamentary forces. Essex remained unwilling to strike although ineffectual artillery fire was exchanged between the two forces. 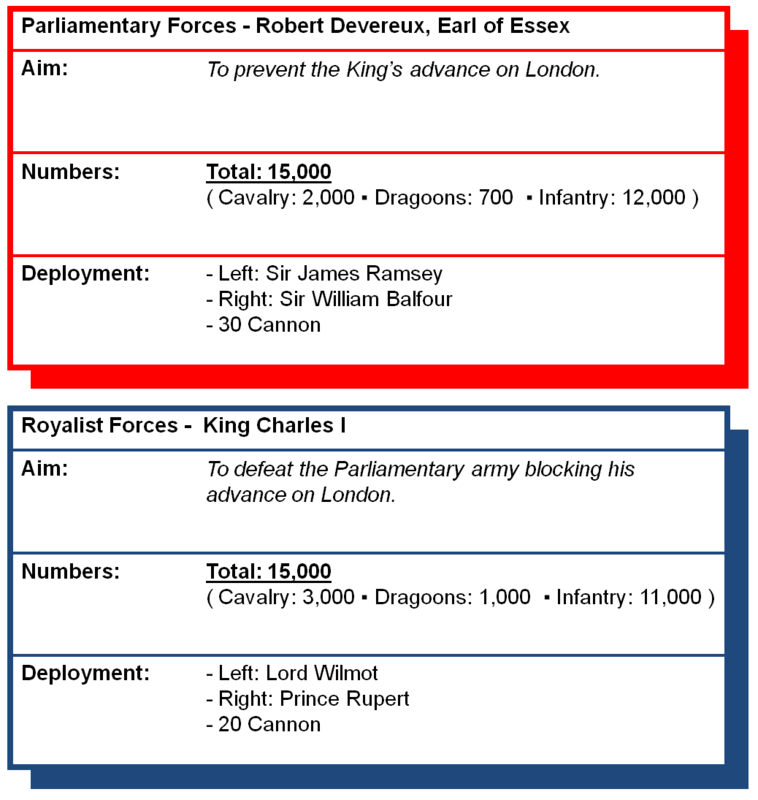 One of the Parliamentary gunners targeted King Charles and a shot narrowly missed him. Around 2pm, once the Royalists were deployed in battle array, Prince Rupert sent forward his dragoons to clear the approaches of musketeers to ensure his cavalry could charge unhindered. After the dragoons had cleared the way, Prince Rupert launched a full scale charge against the Parliamentary Left under Sir James Ramsey who had around 1,200 men to counter the Royalist's 1,700. His force immediately broke and fled towards Kineton taking with it a portion of Colonel Essex's infantry. 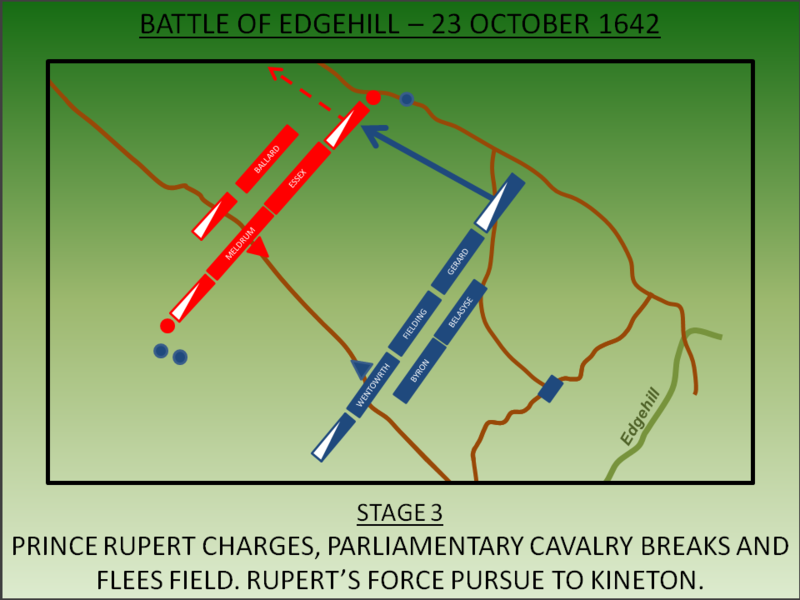 Rupert's force, now unleashed, pursued the enemy cavalry off the field towards Kineton. On the other side of the battlefield Lord Wilmot, in command of the Royalist Left, charged and broke the Parliamentary cavalry opposite him. However the angle of his charge meant that some of the cavalry on this side, which may well have been stationed directly behind Meldrum's infantry brigade, was not engaged by Wilmot. This unit, under Sir William Balfour, held its ground. Concurrently the Royalists commenced a general infantry advance. 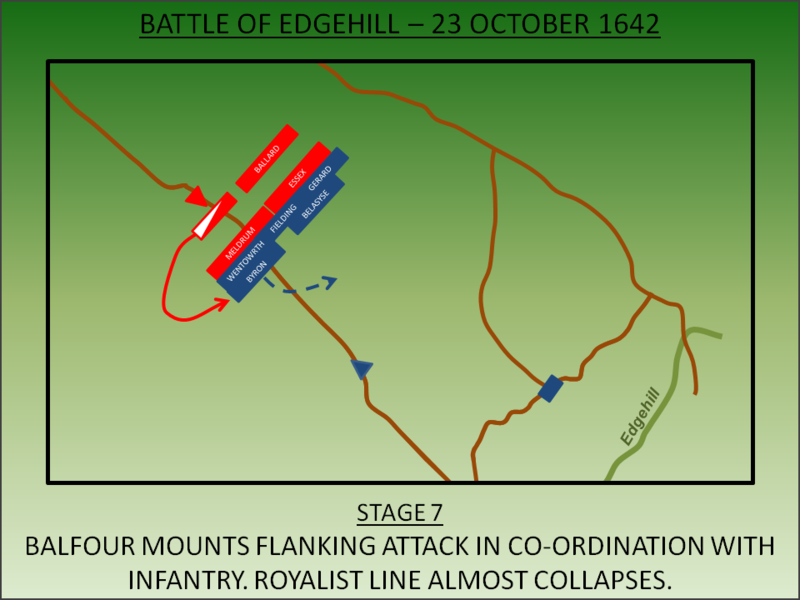 The Royalists infantry initially succeeded in pushing the Parliamentary troops back but the latter stabilised their line and a stalemate soon emerged. Essex now held the advantage; the great strength of the Royalists had been their cavalry but this had entirely left the field pursuing their opponents. By contrast a portion of Parliamentary cavalry, under Sir William Balfour, was still in position and ready for deployment. They charged at the Royalist line with Balfour breaking through and attacking the heavy artillery in the rear. Upon his return to his own lines he came under fire from his own side prompting closer co-operation with Meldrum's infantry for his next sortie. Balfour's second charge was almost decisive. In co-ordination with Meldrum, he attacked the Royalist left flank under Byron causing a shifting of the axis of the battle as the King's army attempted to compensate. For a short while the situation looked perilous for the King's army with the Royalist infantry line coming close to collapse. The Royalists fell back to a brook that ran the length of the battlefield, the banks of which provided a buffer between themselves and the Parliamentary attackers. Stability was then restored with support from their artillery and a timely return of Prince Rupert with a portion of his (exhausted) cavalry. Sunset was around 4.30pm and, with darkness approaching and both sides now low on ammunition, the two forces disengaged. The King held his ground ready for a further contest in the morning if required. Essex however considered his army in no condition for a further fight and withdrew towards Warwick leaving the road to London open. Casualties were around 1,500 on both sides and must have been an awakening moment for both sides. Neither achieved a knockout blow and it would have been apparent that an extended conflict was now a distinct possibility. Edgehill was, however, a victory for the King. As much as his line was almost broken, ultimately it held and by the morning of the 24 October the Parliamentarians had withdrawn leaving him free to advance towards London. Charles entered Oxford in triumph a week later but he would never get to London. 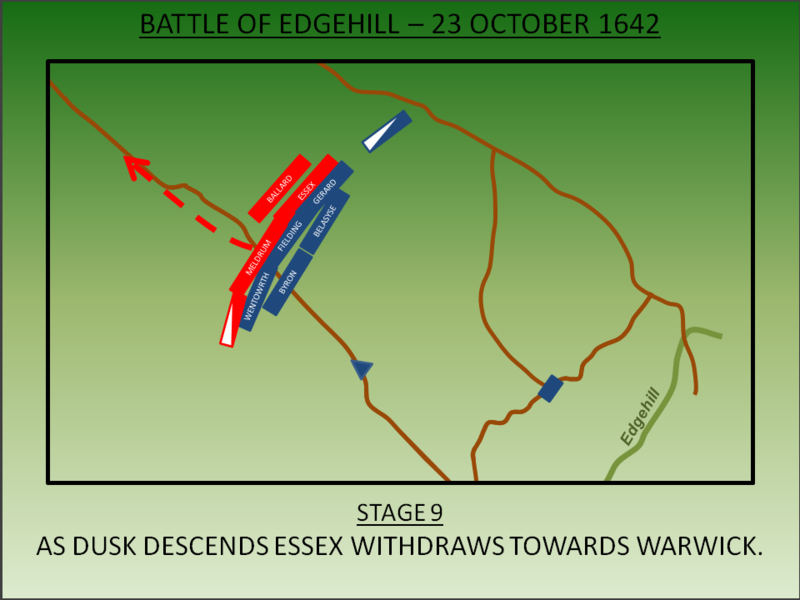 Essex had driven his army on a circular route and established himself in the capital by 8 November where the residents had armed themselves against the Royal advance. By the time the King arrived in mid-November his army of 12,000 men faced one twice the size. Charles withdrew and Oxford now became his capital city for the duration. English Heritage (1995). Battlefield Report: Edgehill. Swindon. Foard, G (2005). Edgehill Battlefield Survey. Battlefields Trust. Lancaster, J.H.D (2014). Edgehill: Battlefield visit notes and observations. CastlesFortsBattles.co.uk. Ordnance Survey (2015). Stratford-on-Avon. 1:1250. Southampton. Roberts, K and Tincey, J (2001). 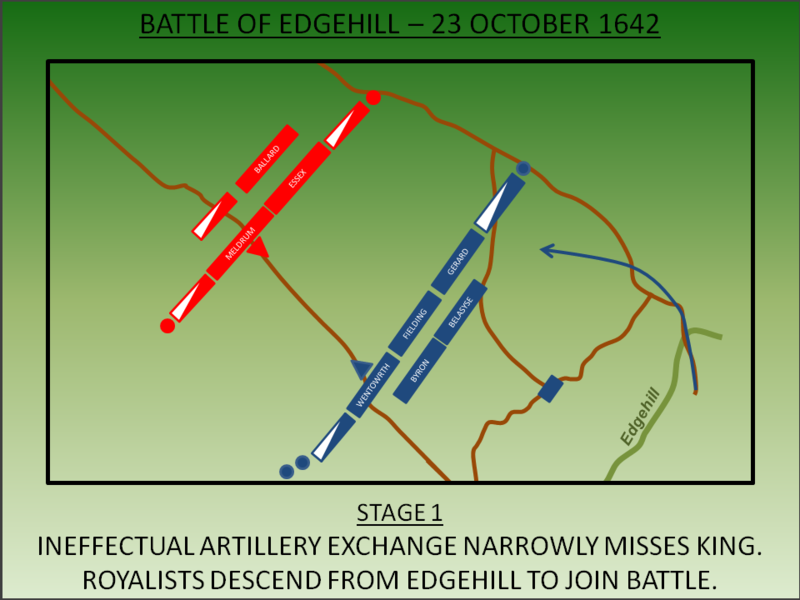 Edgehill 1642. Osprey, Oxford. Scott, C.L, Turton, A and Arni, E.E.G (2004). 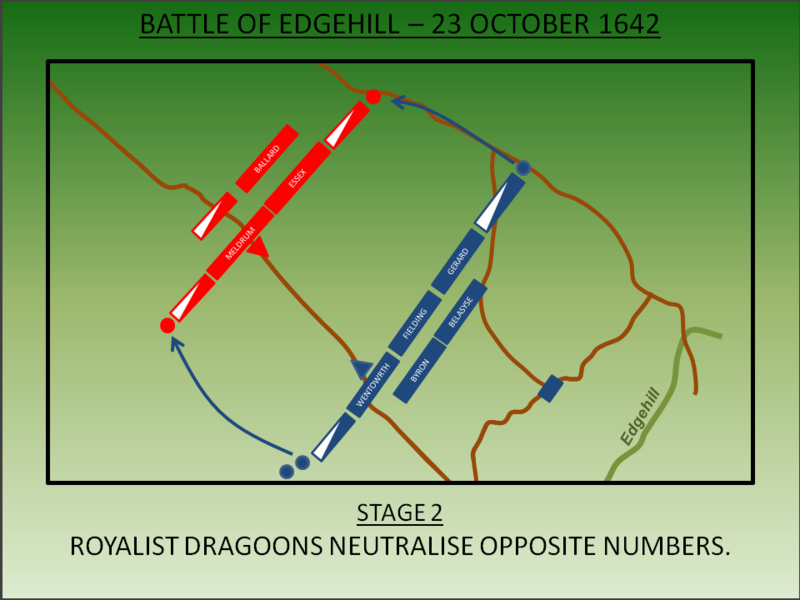 Edgehill: The Battle Reinterpreted. Pen and Sword, Barnsley. Access to the battlefield is very restricted due to a modern military logistics base at the site. No entry signs (of various ages) mark all turnings off the main road (the B4086). However, whilst care should be taken due to traffic (normally travelling at speed), the main road itself does allow a general appreciation of the terrain and if followed south-east the viewpoint from near Edgehill wood (where the Royalists were initially deployed) is impressive. Monument. The battlefield monument is quite lacklustre for a battle that started such a significant war. It is positioned in a lay-by off the B4086. Keep Out! Much of the battlefield lies under a Ministry of Defence depot. You won't ever really be in any doubt they want you to keep out. View from Edgehill. The Royalists descended from here to fight the battle on the plain. 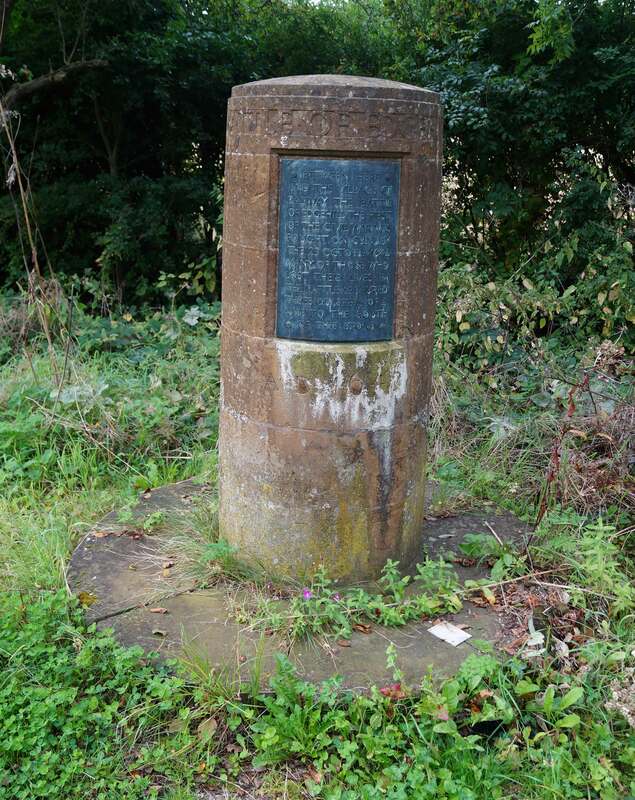 The monument is not sign-posted but is easy to find on the Banbury Road (B4086) positioned at a lay-by suitable for three or four cars. The monument is small (around the height of a dustbin) so don’t look for a massive structure!